Action in the match against Timor Leste in Kuala Lumpur, Malaysia. The Azkals were made to survive a spirited fightback from their opponents to secure a 3-2 win over Timor Leste in the AFF Suzuki Cup. The win yesterday (Saturday, November 17) sees the Philippine national team hold on to their 100 per cent record in the group stage of the tournament. With six points already in the bag, the team’s dream of reaching their first tournament semi-finals remains alive. Sven-Goran Eriksson — the ex-England manager who has recently taken on the role of head coach for the team — said: “It’s very important, of course, to have a change to go through to the semi-finals in this cup. But to do so, I think we have to improve. The Azkals bucked a slow start to the contest. 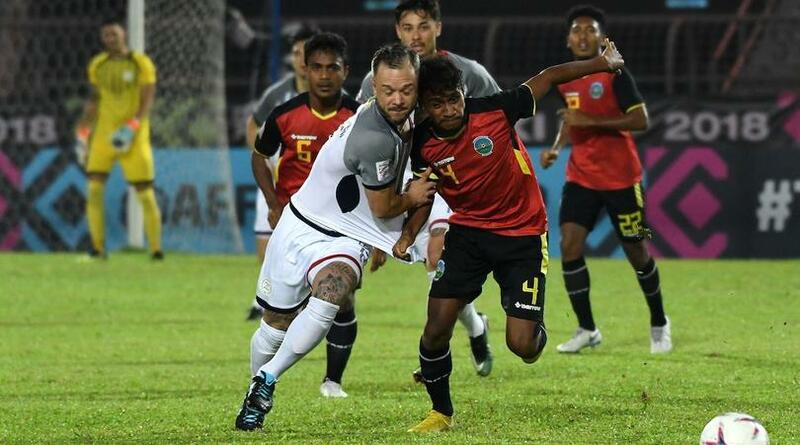 Philippines goalkeeper Michael Falkesgaard – who started instead of Cardiff City’s Neil Etheridge – had to deny Timor Leste defender Nelson Viegas with a fine save to keep the scores level. The Filipinos then gradually grew into the game and soon broke the deadlock. Stephen Schrock set up skipper Phil Younghusband, who shot past Timor Leste goalie Aderito Fernandes in the 27th minute. It was the Davao Aguilas forward’s 52nd international goal in his 101st appearance for the team. With the floodgates now open, the Philippines enjoyed another goal in the first period thanks to Martin Steuble. Come the second half, the Azkals were noticeably a step slower than their opponents and became prone to defensive errors. Carli De Murga looked to have sealed the three points for the Filipinos when he headed in Ingreso’s free kick in the 67th minute. From then on, Timor Leste rallied back in impressive fashion with two goals — but it wasn’t quite enough to seize victory. Up next for the Philippines is a tough test at home against Group B favourites Thailand. The game will be played next Wednesday (November 21) at the Panaad Stadium in Bacolod City.